We will depart from London and will travel towards North Wales. We will reach our first destination which will be Llandudno. Llandudno is Wales’s largest seaside resort with an air of elegance. It has an impressive Promenade, which adds to the Victorian charm of the town. There are two beautiful beaches, which are located at the picturesque backdrop of the Snowdonia Mountains. It meets up all the expectations of the traditional seaside resort, like Punch and Judy shows and fantastic fish and chips. There are many things to do in Llandudno. Take a walk along the longest pier in Wales; ride on Britain’s only cable-operated tram to the summit of The Great Orme. Llandudno Museum is well worth a visit and shopaholics will love the recently opened Victoria shopping centre. Enjoy a ride on the Llandudno Cable Car during your visit to this beautiful resort. As the cable cars glide silently from Happy Valley to the summit of the Great Orme (679ft) a magnificent panorama unfolds - breathtaking views of Llandudno, the Little Orme, Conwy Estuary and beyond. The Llandudno Cable Car is the longest passenger cable car system in Britain. Choose return (18 minute ride) or single from Happy Valley or the summit. Or you can enjoy the Great Orme Tramway, which is Britain's largest and most spectacular funicular tramway. The Tramway climbs one mile to the Orme's summit offering breathtaking views of Llandudno's magnificent bays and beyond! The Tramway has been thrilling old and young for over 100 years and is a unique attraction not to be missed! Before your return journey enjoy spectacular views of Anglesey, Puffin Island and the mountains of Snowdonia or explore the many delightful walks over the Great Orme with its nature trails and prehistoric remains. We will pick you up again from the beach and will depart for the wonderful Marine drive. The Marine Drive is a four mile scenic drive round the base of the Great Orme headland, from Llandudno's North Shore to Llandudno's West Shore and it has much to interest the traveller. Along Marine Drive you will see a small building that has the appearance of a small castle. It is in fact a lighthouse that was once used to warn boats that the Orme was close. After about 1.5 miles (2.4 km) a side road leads to St. Tudno's Church, the Great Orme Bronze Age Copper Mine and the summit of the Great Orme. You’ll find sandy beaches and spectacular mountains, popular resorts and off-the-beaten track villages, advice on where to shop and where to stay, sports and activities on land and water, walking trails and wildlife. You’ll find sandy beaches and spectacular mountains, popular resorts and off-the-beaten track villages, sports and activities on land and water, walking trails and wildlife. It is one way only for the first 3½ miles and enjoy spectacular views at every turn – We will stop at many places to enjoy the view and take snaps to enhance your beautiful memories. Please visit the following website prior to departure to plan your visit in advance. Later we will check in to the hotel for a night stay. We will depart around 8.00 a.m. for our main attraction which will be Snowdon Mountains. Snowdon is the highest mountain in Wales with an altitude of 1,085 metres (3,560 ft) above the sea level. It is highest point in the British Isles outside the Scottish Highlands. It is located in Snowdonia National Park in Gwynedd, and has been described as "probably the busiest mountain in Britain". It is designated as a natural nature reserve for its rare flora and fauna. Snowdonia's landscape is unique. It has total nine mountain ranges, which cover approximately 52% of the Park and include many peaks that are over 3,000 feet (915m). Apart from the beauty and charm of its high mountains, Snowdonia is a delightfully varied landscape of steep river gorges, waterfalls and green valleys. Every year over 6 million visitor days are spent here. Snowdonia’s landscape is unique. It has total nine mountain ranges which cover approximately 52% of the Park and include many peaks that are over 3,000 feet (915m). Apart from the beauty and charm of its high mountains, Snowdonia is a delightfully varied landscape of steep river gorges, waterfalls and green valleys. Every year over 6 million visitor days are spent here. We will arrive at Llanberis station to begin our adventurous journey. Llanberis in the heart of the Snowdonia National Park, to experience the awe inspiring journey by rack railway to the summit of Snowdon the highest mountain in Wales and England. From the moment you leave the station your train will begin the journey upwards to the clouds, a journey experienced by some 12 million intrepid travellers since 1896. If you are lucky enough to have tickets on the “Snowdon Lily” your carriage will be pushed by one of our original 1896 steam locomotives and you will immediately begin to hear the noble engine exerting its effort as you climb upwards and on towards the roof of the principality. From the first glimpse of the waterfall in Llanberis to the point at which your train crests the mountain 60 minutes later you will have been surrounded by the views and the experience that is Eryri, the land of the Eagles. The views from the train as you are carried along a ridge to the Summit are truly breathtaking. You will have one of the world’s most spectacular panoramas at your feet. On very clear days at the Summit you can see as far as the Wicklow Mountains in Ireland and the Isle of Man. The Summit of Snowdon and Hafod Eryri, the new Summit Visitor Centre is amazing feat of engineering opened in 2009. This fantastic new destination is sympathetically designed to complement the landscape. This landmark building grows out of the mountain and features spectacular panoramic windows giving travellers to Hafod Eryri unimpaired views across the mighty Snowdonia range and up to the summit. 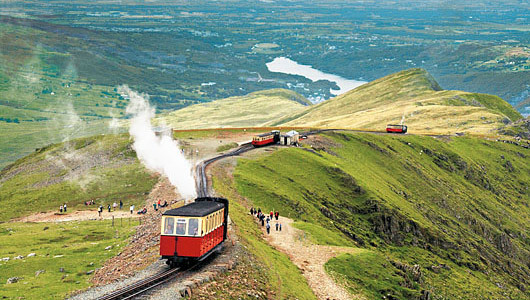 Please book your Snowdon Mountain Train ticket in advance to avoid disappointment on the day. Please make sure to book your tickets between 9.00am – 1.00pm, as we will start our return journey at 4.00pm. WEMBLEY – 5.30am OUT SIDE SANATAN HINDU MANDIR, EALING ROAD, WEMBLEY, HA0 4TA. · Child aged 3-14 must share a room with 2/3 adults. · Any expense of personal nature. · Any expense for food or snacks during the day.